Waterless urinals with video technology – another kind of advertising platform! 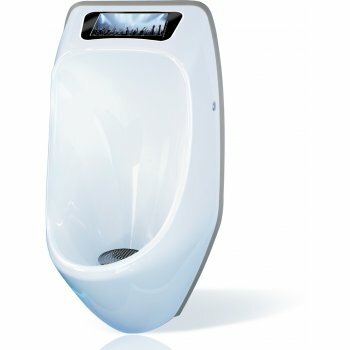 The waterless urinal from URIMAT with integrated media panel is unique and unbeatable in its advertising effectiveness! For years now, advertising messages have been targeted towards millions of users through this innovative medium. In a continuously changing media environment, URIMAT has now launched a new way of advertising. Using state of the art video technology, moving pictures and information can now be displayed over the URIMAT media platform. The compactvideo waterless urinal offers a 7″ LCD monitor with integrated storage (2GB) through which data such as videos, advertising commercials and other information can be displayed via USB memory sticks or a VGA port. The URIMAT video module can be retrofit installed into the URIMAT ecoplus and compactplus models.